Whether or not an outer planet can be said to be 'Lord' of an eclipse, the 'wild card' component of all eclipses is here intensified by its nearness to quirky Uranus so the typical 'expect the unexpected' caution is advised. Additionally unexpected and/or surprising events (negative and positive) occur early or later on into 2015 as spurred by this Uranian eclipse. Plus, as you know, planet Uranus, planetary emblem of freedom, independence, and revolt tends to be activated whenever America engages in war. Besides the presence of Uranus intensifying worldwide implications of the Oct 8th Lunar Eclipse (with Moon ruling 10th house of Public Status and Wider World--and US natal Venus, Jupiter, and Sun snugged around the MC, The Goal Point), Uranus's Aquarian association with humanitarianism is another of its facets and the need for philanthropy becomes more dire as warring nations create millions more refugees and cause other forms of loss for their populations (Moon) such as for those considered by governments to be merely some of the statistical 'unintended consequences' of bombing and airstrikes, thanks to the folly of war and the depravity and corruption of governments. First, Venus squares Pluto (0A20) indicating that actions will receive more serious responses than expected; plans backfire and make matters even worse as rage, resentment, and passions from the past are aroused. (Whoever thought that stirring up the powder keg that is the Middle East was a good idea? 'Just say No' to ancient passions. Or, nyet, if you prefer.) And it isn't as if modern national boundaries weren't arbitrarily set up by the West, is it? It's galling is what it is--for decades. The second applying aspect of Venus in diplomatic Libra (I wish!) is an opposition to Uranus, an aspect of break-ups and quarrels in most anyone's horoscope. On the mundane level we may expect such things as a clash of values along with prejudice and judgmental attitudes on all sides as an atmosphere of unfairness under girds the action, violence, and retaliation. The Venus-Uranus opposition is why I title this Lunar Eclipse as one of 'Clash of Values/Scapegoating' for misguided or misdirected actions are mainly what are taken and are part of the projection tendency mentioned above. Should I mention that these planetary portents are also influencing Washington DC politicians right now? Will the American people vote the anti-government, anti-democratic usurpers and Uranian anarchists and zealots (Uranus in Aries) out of office on November 4, 2014? I hope we will. With astrological Moon ruling We the People, the Lunar Eclipse's separative, disruptive Venus-Uranus opposition may indicate such an outcome especially if women (Venus), young people, and minorities show up and vote on behalf of their best interests. No, Democrats are far from perfect but we know what austerity and breach-of-trust behavior to expect in 2015 and beyond if Republicans gain the upper hand. So a cosmic spotlight is here places upon an Hour of an OOBs Mars in religious quest-seeker Sagittarius so he's off on his own, away from the earthly plane--not cooperating with the other actors (planets), and 'doing his own thing'. That this may well include guns, bombs, executions, arson, destruction, and more is unfortunately expected by yours truly who would dearly love to be over-reading the situation. However, warrior Mars sits at the midpoint of Saturn and Pluto denoting violence, brutality, assaults, fanatical adherence to principles, and a need to fight for one's existence--and this describes the existential threat that Washington says the American people face as do the good people of the Middle East in our dead-end psychosis of West v East conflict. 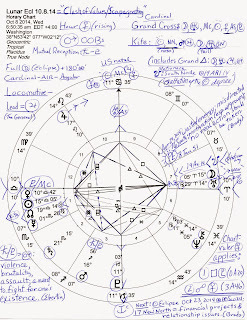 We partially mentioned above the Sun-Moon-Pluto-MC configuration which becomes a Cardinal Grand Cross in the chart if MC is counted. But we don't have to count the MC (not a planet but a place for expression of energies) because we can replace this MC with US natal Sun (13:19) in Cancer if we dare. 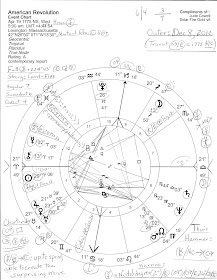 Then we have natal Sun (the leader)-Pluto = Moon, a picture of basic changes that effect the flow of events, fluctuations when appearing strong-willed, and/or efforts to bring aid to those in need. Pluto-MC = Moon also applies here and denotes a determination to overcomes decisiveness and to forge ahead with objectives though these may be subject to change (Uranus-ASC = MC.) 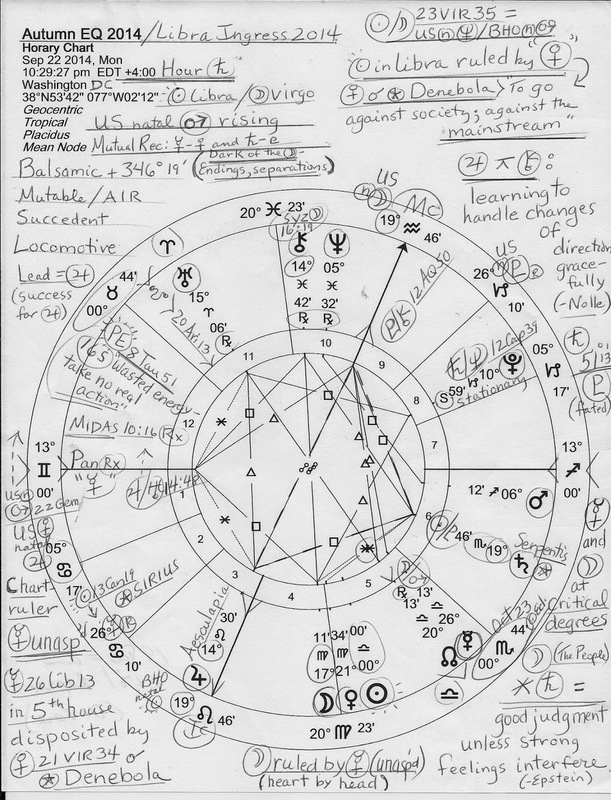 Naturally, the ongoing opposition and its challenges to the President from powerful, super-wealthy Pluto is a major part of everyone's problems. 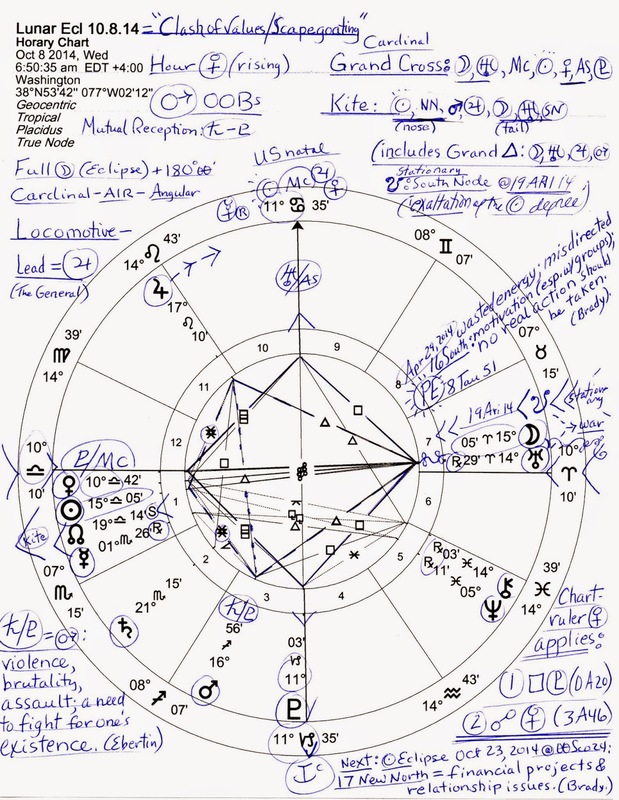 Additionally in the Lunar Eclipse chart is a Kite pattern (a modified Grand Trine) with its nose the Sun, its wings Leonine Jupiter (lead planet in a Locomotive pattern...our commander-in-chief?) and activist and soldier Mars 16Sag56, and its tail the intense, excitable Moon-Uranus conjunction. Kites add two sextiles of opportunity to the Trine along with an opposition--here, its the Full Moon Eclipse itself--though Uranus chimes in as discussed. The additional aspects within the Kite suggests that errors in judgment can be corrected since special skills are indicated. 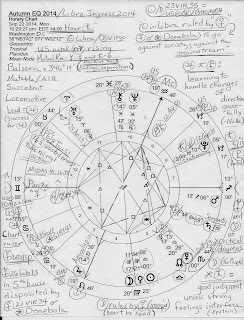 Note that the Cardinal Grand Trine is between Moon-Uranus, Mars, and Jupiter; the Sun (#POTUS) has the special skills to 'fly' this Kite of success. Unfortunately, the American public can no longer be certain just what the US government actually considers to be 'success'. Approximately two weeks later a Solar Eclipse occurs and hits the natal Suns of the UN and of the modern New World Order--both charts are for October 24th, the UN in 1945, the NWO in 1993, year of the 'Age of Reason' planets' Great Conjunction/s at or near '18Cap': POLITICAL POWER in the Sabian Symbols. Word Picture: "The Union Jack Flies from a British Destroyer." Take from that what you may for the symbol stands for SUPERVISION in the Marc Edmund Jones version with its negative (shadow side) expression: "smug or strong-armed paternalism." And this is what Britain and other Western nations used when forming arbitrary boundaries across the Middle East and now bomb it to smithereens, and also describes the draconian surveillance and oppression they use against their own people now. It's a Mercury Hour with Mercury Rx in the 6th house of Military-Police Service as our troops return to duty and transport and communications may perhaps be somehow disrupted or delayed (Mercury Rx.) Yes, someone is being facile with facts and numbers yet there are glitches and possible discrepancies involved as well. At least the previous Cardinal Grand Cross of titanic struggles has somewhat lifted since October 8th but I wouldn't suggest celebrating just yet! So what's the karmic potential of this eclipse? Forgiveness is the key to progress! 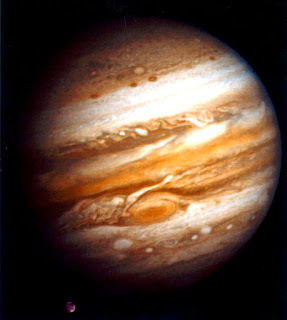 Now Jupiter @19Leo26 in 5th house of Risk-Taking continues to lead the whole group of actors in a Locomotive pattern suggesting a high-powered executive with great leadership skills. "Get on board or get left behind" is his motto and a certain ruthlessness may be in evidence especially if you see the situation as I do--a world government struggling to be implemented by global operatives which include US officials, the Pentagon, and Eastern officials, too! With our guys, their oaths of allegiance have been secretly made to what they consider a much higher authority--not the US Constitution. In America this applies to both Republicans and Democrats--you know, the corporate sell-outs and infiltrators among us. Yes, NWO engineers want us to feel that this 'order out of chaos' is fated and cannot be avoided but I don't believe it is--at least, not yet. So! 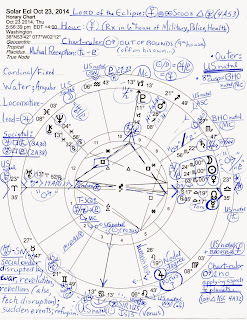 The 9th house (Foreign Lands) chart-ruler Mars makes no applying major aspects to other planets in the eclipse chart of October 23rd which makes Mars' degree, sign, house position, and houses ruled important factors as we go forward. This spotlights the 8th house with 27Sco47 on its cusp (Pres. 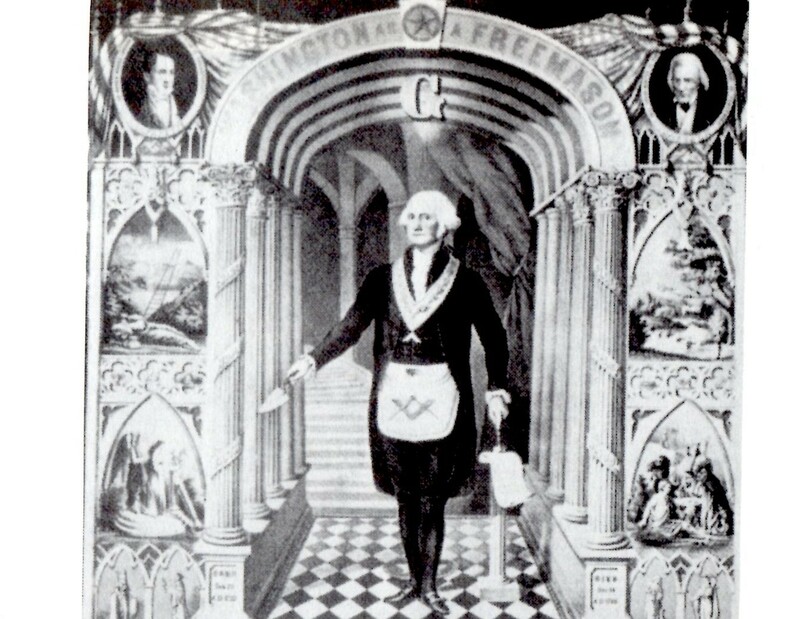 Obama's natal MC degree) and 8th house matters including transformation, death, Corporatism, Big Business, and the occult. 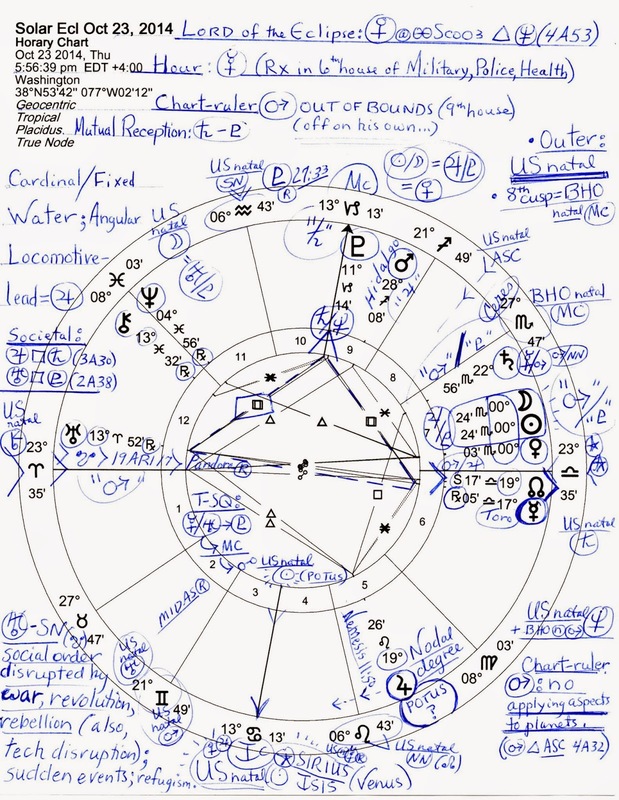 These potential focuses are emphasized even more since the 8th house is Scorpio's natural house in Western Astrology. In fact, when the Oct 23rd chart is set for DC, all the eclipse houses have their natural signs on its cusps and the 1st-8th house possibilities include not just death but health implications as well. Note that one of the power asteroids, Hidalgo, conjoins this non-applying, out-of-bounds Mars which may denote fortune-hunter and social climber vibes to the archetypal warrior's quest/s, plus a little company during his sojourn of isolation. A full 7th house of Partnerships and Open enemies seems problematic for the US--is Washington depending too heavily on what other nations will do against ISIS-ISIL? We already know that Congress gave up its power to the White House and Pentagon (war declaring power), and to international bankers (money-printing power) years ago. Now a Solar Eclipse in the Angular 7th house highlights compromise, cooperation, teamwork, and giving one's fair share as the prominent lessons for making progress and though we all think of global alliances formed in the fight against ISIS, it's not made easy with retaliation and revenge for old wounds in the picture. That's where forgiveness should come in but what are the chances of that especially with US political conflicts ruining all that can be ruined of a president's reputation in self-interested, chest-thumping attempts to win elections and influence people? And this self-defeating tendency in US politics is regularly and profitably used against the American people by enemies open and hidden!